Police forensics officers work around a silver Ford Fiesta car that was driven into a barrier at the Houses of Parliament in central London on Aug. 14, 2018. Britain is facing new security concerns after the second terrorist attack outside the Houses of Parliament in less than 18 months. 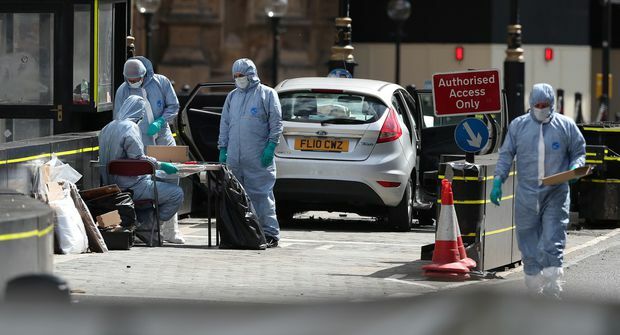 The latest attack came just after 7:30 a.m. on Tuesday when a silver Ford fiesta veered the wrong way down a street alongside Westminster palace, hitting several cyclists and pedestrians. The car carried on at high speed toward an entrance way to the parliament buildings, narrowly missing a couple of police officers before crashing into a barrier. Police moved quickly to arrest the male driver who was identified as Salih Khatera, a 29-year-old British national. They said he was alone in the car and no weapons were found inside. Three people were injured and two were sent to hospital. “Given that this appears to be a deliberate act, the method and this being an iconic site, we are treating it as a terrorist incident,” said Assistant Commissioner Neil Basu of the Metropolitan Police. Prime Minister Theresa May, who is on holiday in Switzerland, called the attack “shocking” although she did not raise the country’s security level, which has been at “severe” for years. “For the second time in as many years the home of our democracy, which is a potent symbol of our precious values of tolerance and freedom, has witnessed terrible scenes just yards from its door,” Ms. May said in a statement. Police appear to have few clues about the attacker or his motive. The driver was not known to the MI5 intelligence service or counterterrorism officers, raising questions about whether he acted alone or was part of a network. Officers said the man was not co-operating; they have no other suspects. By Tuesday afternoon police had raided a house in Nottingham and two properties in Birmingham, where the man is believed to be from. The attack was similar to a terrorist incident in March, 2017, when Khalid Masood ran an SUV onto a sidewalk on the other side of the Houses of Parliament, killing four people and injuring more than 50. He crashed the vehicle into a railing and then jumped out and ran toward an entrance to Westminster, stabbing and killing a police officer who tried to intervene. Mr. Masood, 52, was shot dead by police in a courtyard inside the gates. Police also had little insight into Mr. Masood’s motive and came up with little after months of investigation. "We must all accept that there is a possibility we will never understand why he did this. That understanding may have died with him,” Assistant Commissioner Basu said at the time. Ms. May’s government has also faced criticism for slashing police spending. On Tuesday, her officials were quick to point out that since March, 2017, police had foiled 13 Islamist plots and four planned attacks by far-right extremists. They also added that there are currently 676 active investigations.